While it is usually not necessary to look up information about connected storage devices regularly on a computer, doing so can sometimes reveal important information that help you troubleshoot issues. SSD-Z is a lightweight portable program for Windows that reveals a bunch of information about each connected disk device. While the name hints at it being optimized for Solid State Drives in particular, it displays information about platter-based hard drives, removable devices and even optical drives as well. Since SSD-Z is portable, you can run it from any location on your system. Just download the program from the developer website and extract it to a location on the system. The program is listed as beta and while that is the case, ran stable during tests. It displays detailed information about the first drive of the system on start. You can cycle through available devices using the pulldown menu at the bottom or by simply hitting a number on the keyboard instead. Depending on device type, different information may be displayed. 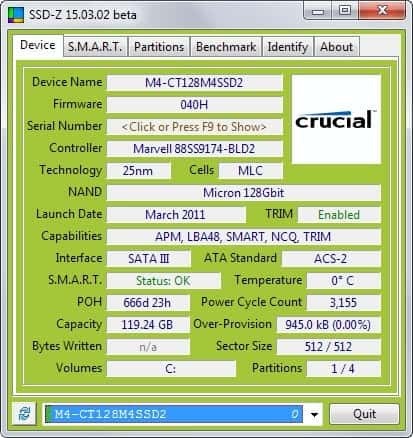 For Solid State Drives for example, you get information about the controller, technology and cell technology, whether TRIM is enabled, and NAND information. For all devices, the full name, firmware and serial number are displayed. There you also find listed the supported interface, capabilities, capacity, information about power cycles and power-on hours. A switch to the SMART tab displays all SMART values of the selected drive if supported by it. There you find additional data -- some of it is displayed on the device tab as well -- that may be useful. Partitions is the third tab. It lists all partitions of the selected drive including data about the master boot record and over-provision. The benchmark tab lets you run a quick benchmark of the drive. The developer notes that results may vary because of the program's beta status. Identify finally displays additional information about the drive including its firmware revision and lots of other information that are rather cryptic to the untrained eye. SSD-Z is not that different from other programs of its kind. Programs like Crystal Disk Info display similar information and if you are already using one of those, you won't find many reasons to swithc to SSD-Z at the moment. The program is portable and lightweight on the other hand using less than 4 Megabyte of RAM while running on a Windows 7 Pro system. And since it has a size of less than 1 Megabyte unpacked, it fits easily on any disc or Flash Drive you want to put it on. I have a old Dell computer that i am working on here. My brother sold it to me, it was always turned on for 4 or so years. Every time i unplug it for a few days, when booting it up again. The BIOS losses the clock time, it is sometimes hard to get the clock set again. Maybe it is time to junk it or find a program that would tell me the problem i have? Does anyone have any ideas for this matter, it has Windows XP, plus Windows 7 operating system. I do love reading all the stuff on your website emails i receive. Sounds like a dead CMOS battery to me. You could replace the battery and see if that helps. It is not the battery, i have tried different ones. interesting tool but far weaker than Crystal Disk Info. It always nice to have two or three applications that can do the same thing, I hated when you fine out that support for the application has ended, so having two or three of the same kind can never go wrong. I use Crystal Disk Info for such information though.